Most firmware files distributed by the manufacturers are uploaded to Baidu, but I’ve found the service not to be always reliable, especially for larger files. In Windows, people are recommended to use Baidu software (BaiduYunGuanjia), but there’s not such tool in Linux, so instead I investigate for command lines tools to download files from Baidu, and this lead me to two interesting tools called Aria2, a “lightweight multi-protocol & multi-source command-line download utility. It supports HTTP/HTTPS, FTP, BitTorrent and Metalink”, and YAAW “Yet Another Aria2 Web Frontend” with allow to start and monitor download locally or remotely. But let’s start with the first tool I found: pan-baidu-download, a Python script to download files from Baidu. But after posting a bug about password-protected download, which was fixed in 2 minutes by the developers, I was informed the script does not support directories, and was recommended to use BaiduExporter add-on for Chrome or Firefox instead. Everything is in Chinese, and after installing the add-on I was not clear how to use it but I figured it out eventually. The command line above is insecure if you plan to run it on a remote server, as anybody could access it, and start download on your server. But for testing, and local download this will do. If you stop aria2c, the downloads won’t restart with this command, but there are options that support this, but again, I have not looked into details for this quick test. 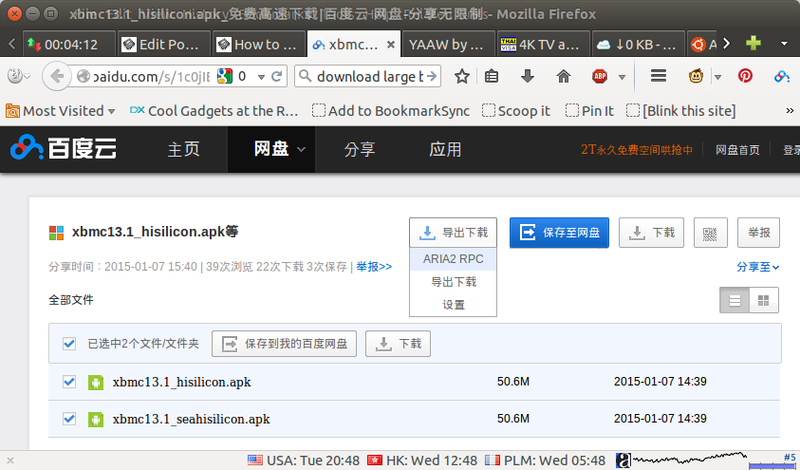 Now go to the Baidu download link, select the files and/or folders you want to download, and provided you’ll already installed Baidu Exporter add-on, a new menu will be shown, and all you have to do is click on ARIA2 RPC to start the download in aria2. The last options with two Chinese ideogram is the option, where you can change the IP of the aria2 server (localhost:6800) by default as well as other settings. This is all good, but in practise you’d probably want start aria2c when your computer boots and would not be able to monitor progress, especially if you use a remote server, and this is where YAAW comes into play. All your settings on web is temporary. Settings will be lost after aria2 restarted. Tasks (including those that are not finished) will be lost after aria2 is restarted. Use --save-session=SOME/WHERE and reload with --continue=true --input-file=SOME/WHERE to continue. Use $HOME/.aria2/aria2.conf to save your options. I haven’t gone into details, but Aria2 and YAAW could be used with a NAS, a cheap board with a USB harddrive, or even USB Wireless flash drive such a Zsun SD111 (which is now hackable even without serial debug board, as the default root password has just been cracked) to make a downloader to handle large downloads instead of leaving your PC on at night, or 24/7. Why not just use Jdownloader? So much easier, downloads fast, resumable downloads, entering capthas, works on Windows & Linux. Might need to set chunks to only 1 for some downloads. Too many connections to Baidu and you have to re-enter a captcha code. I did not know about it. I’ll give it a try. Nice, thanks for those tips ! The main advantage I see over Jdownloader is that it’s a very much lighter solution and you can use it remotely in a client/server configuration. Thanks. Bcloud is interesting too. I’m now starting aria2c automatically, and added access to yaaw via nginx, so I can start large files download to my PC with my tablet/smartphone. So it’s another use case I did not think of at first. Aria2 is MUCH better! Jdownloader is a ram hog that uses about 300MB of ram because it’s a java program when aria2 only uses under 20MB of ram. Also Jdownloader makes the folder structure kind of weird. Hello! I want to download following document from baidu. I do not understand Chinese and moreover it needs some download points to get the full document. Can you help me to get this document? A workaround is to set xpinstall.signatures.required to false with about:config. Sadly BaiduExporter is not working for me in either Firefox or Chrome anymore, so I had to install Jdownloader. I never use baidu etc but reading this reminded me that while reading other blogs, I saw this mentioned awhile back. Not a clue if helpful or not! I can’t see password support. I’ve tried it this morning, and I can confirm password does not work, so it’s basically the same as pan-baidu-download script mention in the post. I can still be useful if you want to download a file shared without password. However, manufacturers seem to share firmware via Baidu with a password most of the time.